An outstanding display of reticulata irises from Jacques Amand in the front of the hall at the RHS flower show last Friday, covering both old and new cultivars. Friday is a first for me in my RHS show-going career, but there was certainly a large turn-out later in the day. 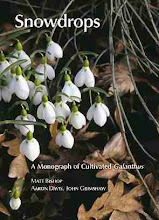 Avon Bulbs' snowdrops were the centre of attraction for the many assembled galanthophiles. Galanthus 'Excelsis' exhibited by Avon Bulbs. A vibrant display from Broadleigh Gardens covering the whole range of early bulbs. A display of sweet violets was charming - and I don't recall seeing such a stand at the February show before. The sumptuous foliage and flowers of Impatiens morsei on Dibleys' stand. In the Woody Plant Committee meeting we were shown a range of the best new introductions of Hamamelis by Chris Lane - a wonderful assortment, greatly enhancing the options available. Edgeworthia chrysantha 'Grandiflora' from Exbury, passed round in the meeting: it is strongly and not pleasantly scented. Cyclamen coum and Galanthus 'S. Arnott', originally planted together in about 2004. This was a wonderful stock of Cyclamen from a Dutch supplier, superb in colour and extremely vigorous, spreading well and coming true from seed. Sunday was the best day we've had for months, calm, mild and sunny, with bees out and busy - at the least, an intimation of spring, much needed after the winter's storms. I was fortunate enough to spend it at Colesbourne Park, where the snowdrops were looking better than ever, and the richness of colour possible in the winter garden was very much on show too. It was nice to be back there with no duties, and free to enjoy the garden as a visitor - but with the memories of making it. The 'spring bling' bed, planted in 2011. Bergenia 'Godfrey Owen' and Yucca 'Color Guard' are conspicuous. Galanthus nivalis on the lake banks - a genetically diverse, self-sowing population, never forming big clumps. Lakeside planting: Cornus sanguinea 'Midwinter Fire' with reeds and other shrubs: the lake was even bluer than usual. To commemorate the Queen's Diamond Jubilee in Shaftesbury, Dorset, a project was launched to plant public spaces in the town with snowdrops. 60,000 were planted in 2012, and the same number last year, with volunteers and schoolchildren helping. 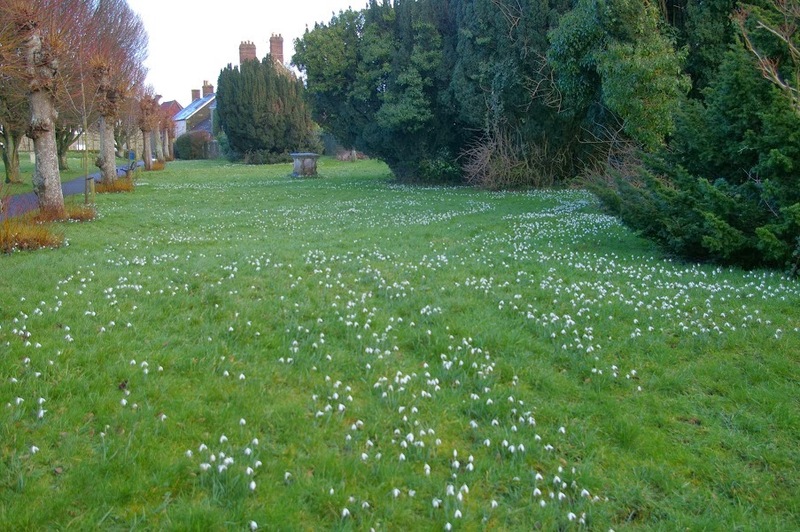 These plantings, now getting established and showing their potential, are the foundation of the Shaftesbury Snowdrop Festival. 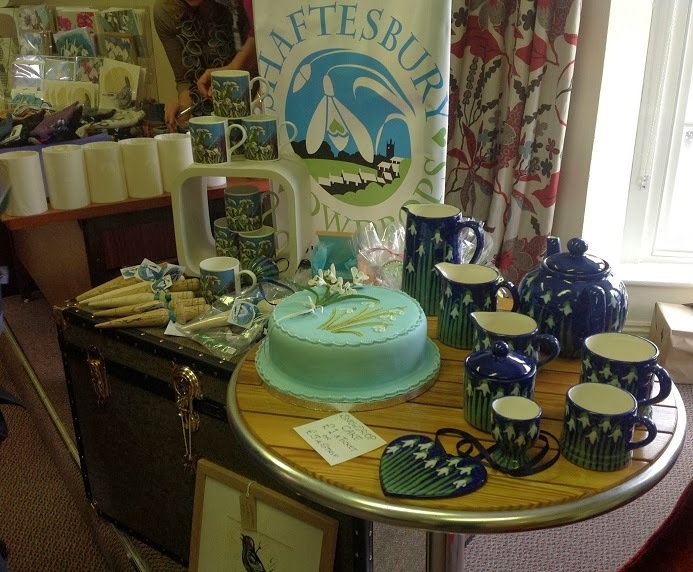 This aims, of course, to bring more visitors to the historic hilltop town out of season, but is also getting the community involved through art displays and the various events organised. 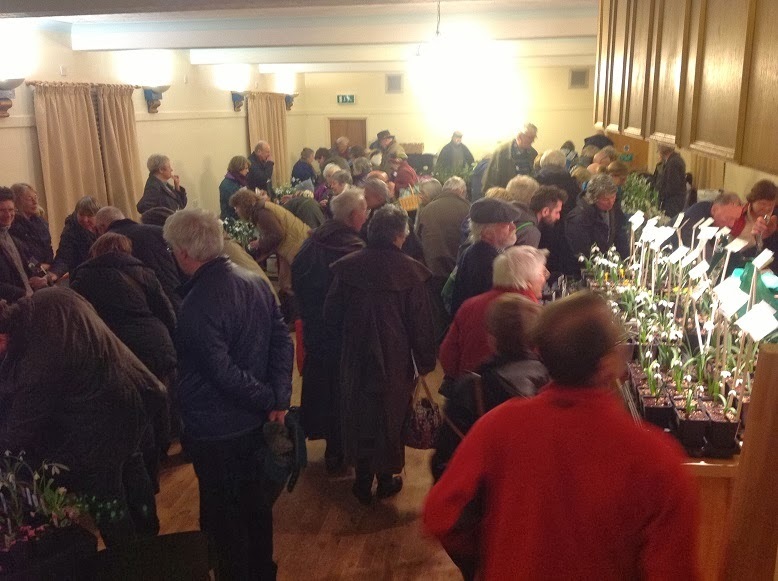 The opening day of this year's festival (continuing until 1 March) was yesterday, and was marked by a snowdrop study day and sale. With three speakers, the sale and an excellent lunch, the day was a great success, and we then had chance to see the plantings in the town and a garden nearby. There are the makings of an annual galanthophile fixture here! Some of the 120,000 snowdrops planted in the past couple of years in Shaftesbury by townsfolk and schoolchildren. They'll soon thicken up. The snowdrop sale attracted the usual frenzy of interest. 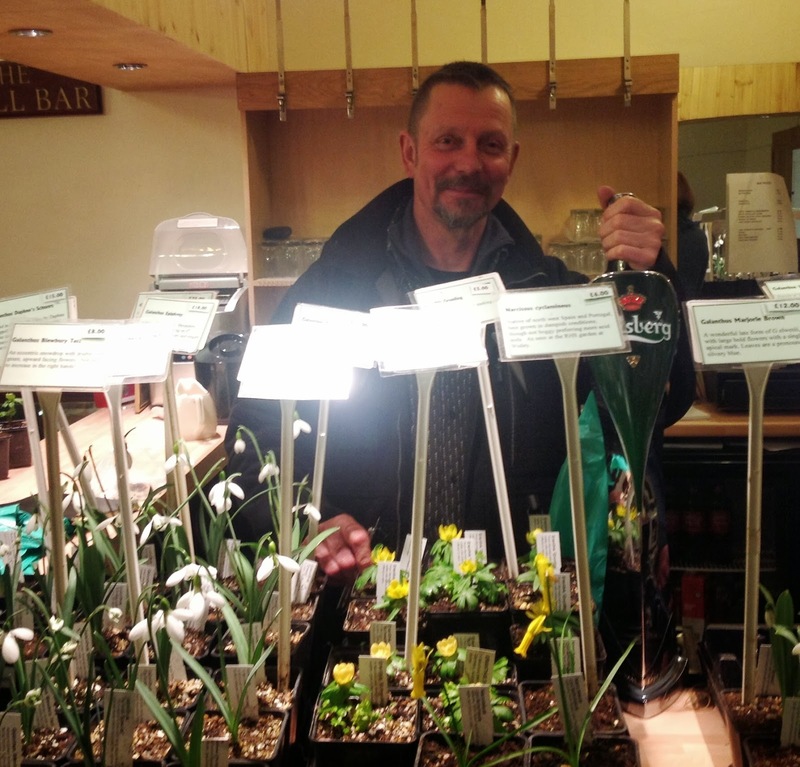 The Bet Lynch of the snowdrop scene: Alan Street pulls on the Avon Bulbs stall. A pop-up shop selling all sorts of snowdroppy items. 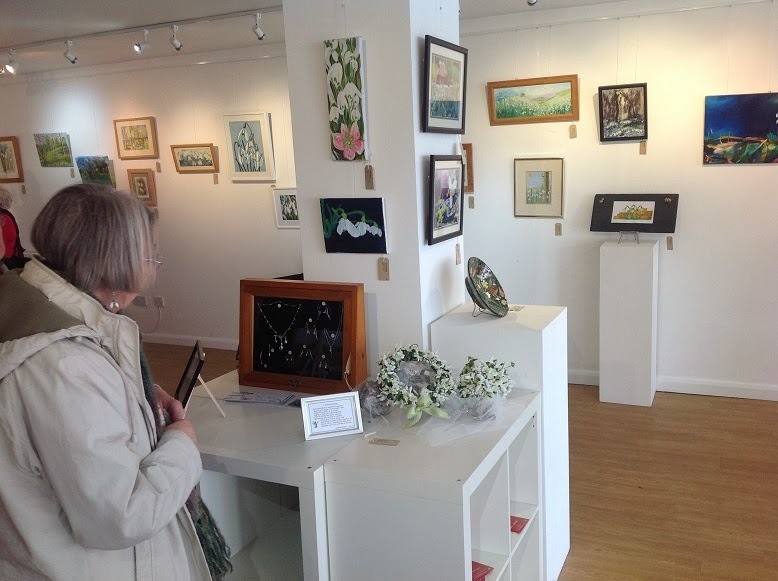 Moira Harries surveys the exhibit of snowdrop-inspired art in the Shaftesbury Art Centre. Emma Thick explains the fine points of snowdrop identification at the display of named cultivars in the grounds of Shaftesbury Abbey. As I write the wind is again wuthering round the chimney stack and rain lashing against the windows, as we receive the current storm hurled across the Atlantic by the jetstream. Here in eastern North Yorkshire we have got off comparatively lightly from the effects of this winter's weather, the brunt of it being relieved for us by the southern and western parts of these islands. A friend's Facebook post this morning drew my attention to a remarkable animation of the weather systems in the North Atlantic for the past couple of months, from the surfers' webpage magicseaweed.com. It is well worth watching (here), as it gives a very dramatic idea of what has come this way. With the jetstream apparently fixed in a standing wave across North America, between warm air and the polar air mass, it seems that we are set for a continuation of the same for some time to come, presumably until returning Spring warms up the landmasses. I use the BBC weather pages for day-to-day weather information, but find it very helpful to look at what the jetstream is doing on netweather.com's jetstream forecast page. This long run of lows is of course the opposite of the extended cold easterly flow we endured last spring, and of the two I prefer the westerlies. But they have caused a lot of trouble and damage that takes longer to fix than a delayed spring. The Settringon Beck, outside my house, in spate after a downpour. Being close to its source it rises and falls very rapidly, soon returning to its normal narrow bed. A serious casualty of wind on Wednesday: an enormous Tilia platyphyllos in the Castle Howard avenue crashed down across the entry to the Yorkshire Arboretum. Its partner in the avenue for three hundred years was removed (being rotten) in January and the gap let the wind in. Pic by Anna Porter. 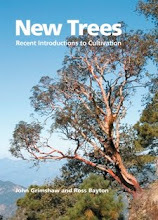 The dismembered lime-tree on Thursday, when the size of the tree was more easily appreciated. These main trunks are 20 m long. Luckily nobody was around as it came down. Between depressions have been calm, bright and quite mild days; Galanthus elwesii 'Comet' flowering here on Friday. and so does a nice fire, here burning the cones of Pinus x schwerinii. A happy sight for the croconut: Crocus herbertii. Primula vulgaris with Polypodium and Cyclamen coum.